Moonmeadow Farm is a small family farm in the mountains of Southern Appalachia outside of Asheville, North Carolina. We are dedicated to producing as much of our own food as possible, with varying degrees of success. I have dreamed of having a farm since I was a small child growing up in the suburbs of Atlanta. I used to spend time in the woods behind our subdivision attempting to build log cabins, grow a garden, and figure out a way to hide a horse from my parents. Visiting my aunt and uncle in Blowing Rock. That's me in the blue coat. 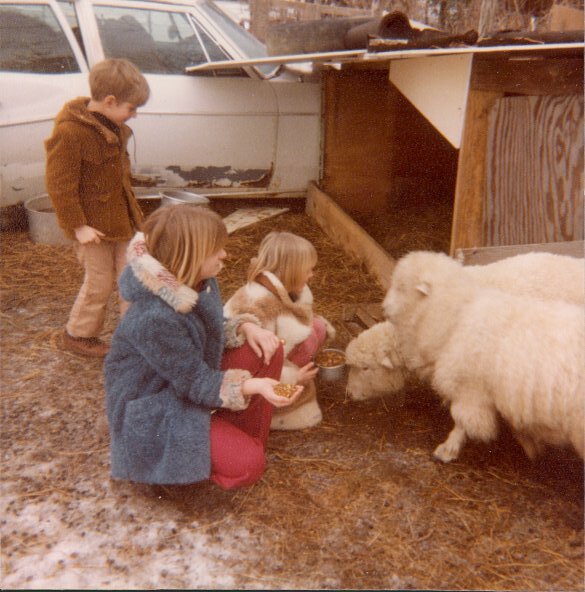 Then two things happened which really helped shape my future: first, my aunt gave me a set of the Foxfire Books when I was 13 or so, and then around the same time, we visited another aunt and her family on their sheep and blueberry farm in Blowing Rock, NC. Thanks—I’ll get right on it! Prentice saw my spinning wheel & some cotton I have waiting to clean & directed me to your site – when the photo of the 3 kids came up he said “hey, that’s me!” He’s screening in my front porch and building me an Arbor and (shudder) painting the trim on my house which he detests. Hi Kathy! We would love to learn to spin (and grow) cotton—but alas, our growing season is WAY too short up here in the mountains! I’m glad somebody’s keeping Prentice working! Don’t know what’s up with the feed from realfoodblog.com.. I have posted 10 items since the last on listed on yr page. Maybe you need to resubscribe to my feed. Thanks!!!! OK—wonder what’s going on? I re-listed it, let’s see if that helps. I lived in Asheville in the early 70’s when I was between 8-12 years old. I have the best childhood memories from living in Asheville from riding horses on the Biltmore Estate to camping and hiking on Mt Pisgah. I was born and now live in Athens, Ga with my husband (HB) all three of my grown children live nearby as does our first granddaughter. I have really enjoyed reading your blog!